Keep the flame burning for the light of your life, with our Tea Light Candle Holder. The Tea Light Holder has a Crystal AB foil base which adds a hint of various colours at certain angles of light, therefore does not require a light base. 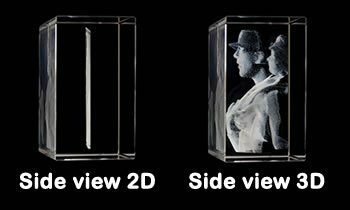 We can engrave any image of your choice into a high definition quality 3D image. You can have a Loved one, Child, baby, Partner, Mum & Dad, Aunt & Uncle, Pets... Dog, Cat, Horse etc.... Include a line of text free of charge. Engraving area is 60(h) x 50(w) x 50mm (d), the overall size is 80 x 50 x 50mm.